Ashle Danger is a journalist, a gamer, and a self-professed “weirdo”. She doesn’t see her weirdness having a negative connation though, she embraces it. 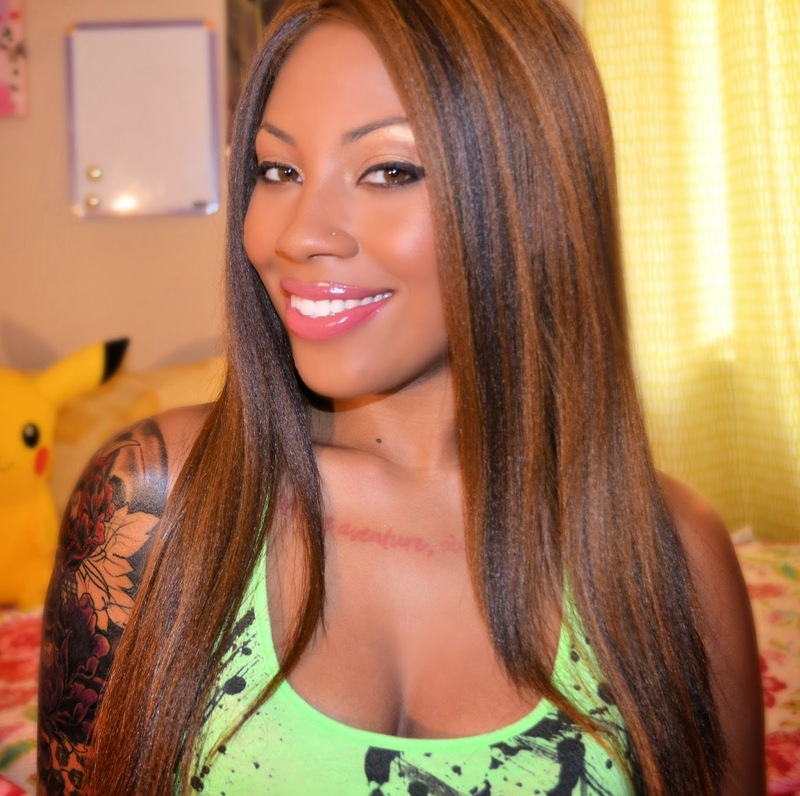 Her geekiness is defined by her love for video games and most of all Pokémon- exemplified by her tattoo of Pikachu. She has created her own entertainment website Strange Wonderful that features the latest in movies, music, comics, gaming, and much more. Her vision goes beyond her website with sights set on being a film director while creating movies and writing books. Ashle Danger is strangely wonderful. Her encouragement of others to celebrate their uniqueness is what makes her special. She has a clear idea of what she wants and whether her next creation be a comic book, graphic novel, or a movie it will be nothing short of exciting. First and foremost, you are a journalist. What do you think has been your finest accomplishment in your journalism career? Yes, yes. So far I’ve had a great start into my career as a journalist. There’s still so much I want to say and do and I’m trying to do it all this year. So far I think some of the coolest experiences I’ve had are that I got my site up and running and have been having a great time with that and now I’m writing for a new magazine, Cosplay Culture and I’m the senior staff writer. I’ve been having my hands full lately with it being a startup, but it’s been exciting to create. I got my start in modeling during high school when I actually wanted to be a graphic designer and would take pictures of myself, do the styling and the editing myself and posting them on Myspace and photographers started messaging me to shoot. It really wasn’t my goal, but it happened. How did you come up with the idea for Strange Wonderful? Strange Wonderful started originally as AshleDanger.com which was my site about me, gaming and fashion. Then I wanted to branch out and give other writers and bloggers the opportunity to share their same passions on things that are typically what I’ll describe as something that may seem Unique, Weird or Different that at the same time are completely awesome. Everything from Music to Comics, Gaming to Fashion, Relationships and Food. I find inspiration in things that aren’t typically trendy, but yet still are very interesting. You’re a self-described geek, what are some of your geeky obsessions? Some of my geeky obsessions are video games; of course, I’m completely obsessed with Pokemon and have always been, also I’m a big Harry Potter fan. The things that made up my childhood are still very much inspiring to me. I love My Little Pony as well. Some other things I really love are dressing up as some of my favorite characters Harley Quinn and Cat Woman are like two of my alter egos lol. In one of your YouTube videos you said “Looking at me, you wouldn’t think I am a geeky girl...”. Do you feel underestimated at times being a geeky girl? I feel like when people first meet me, they see me and automatically assume I’m one type of way, then when they actually get to know me they there in shock that I’m such a weirdo. When people hear the word weirdo they probably see it as negative, but I don’t, I’ve accepted my weirdness. I like things that people would typically think “only kids like that” those are the things that make me smile, and kids are happy for a reason right? On the flip side of that a lot of guys get to know me and realize I’m like “one of the guys” once I get comfortable with people things get a little strange. They act surprised when I’ll game and start cursing and then they realize I have a potty mouth. Also I really love food lol. How has your work as a film student influenced your writing? There have been a lot of times I’ve watched something or have had an experience and it makes me want to write it down and really think about it later. Sometimes you go somewhere and a picture isn’t enough, a video isn’t enough, you want to hear and read the story. I feel like one day, even if technology is no longer around or there’s a power outage, your words still remain. The words that inspire you, you’ll never forget. But at the same time, sometimes you’ll read something and begin to visualize it. There are few stories I’ve been writing that I hope to one day turn into a book and possibly a movie. In your editorial Happily ever after is waiting for you you talk about trusting your instincts, staying true to yourself, and going after your dreams. What compelled you to write that piece? May 16th, 2014, the only reason I know that is because my blog is the date of when I first drafted something, I was starting a new transition in life. I think we all come to a point where we’re doing something, or working a job that we can’t imagine doing forever. I was working for a cosmetic brand and started to feel lost. Like I was just working every day, and started becoming really depressed, I was in the beginning of a new relationship that wasn’t all that I had dreamed it was going to be and realized I had to start really thinking about myself and my dreams. I wasn’t blogging as much and started to feel like a piece of me was missing because suddenly I became quiet. I had to remind myself that in every fairy tale none of the princesses had an easy start. They all had challenges they had to overcome and that’s what I used to get myself back on my horse and go back to chasing my dream. You’ve stressed the importance of promoting girl gamers. Why do you think there is lack of girl gamers? For the girls out there that are gaming do you think they are being represented well? Actually I know there are a lot of girl gamers out there, but many of them don’t talk about their passions for gaming, I feel like possibly they may feel like they don’t know other girls that play games or maybe that they will be judged but there are plenty of us. I feel like we are represented well, but the problem is the stigma that there is only one right way to do something. Just like how diverse people are there are all different types of gamers, and definitely different types of gamer girls. We all don’t play princess games or cute platformers, just like all guys don’t play Call of Duty or Grand Theft Auto. Which of the past events that you’ve covered we’re your favorites? And which events do you look forward to covering? New York Comic Con has been my favorite so far I’ve been the past two years, this year I’m really looking forward to the Pax East in March and who knows what else I’ll find my way to. You have very creative tattoos, such as your Pikachu, from Pokémon, tattoo to your phoenix tattoo. What was your first tattoo? And which ones are the most significant for you? My first tattoo is the little scruffy alley cat that’s on my hip and says Sunny under its tail. Sunny was my nickname when I was younger, short for sunshine because I’m always happy. Most of my tattoo artists have been dying to cover it up, but I won’t let them. It’s like a piece of history; maybe I’ll color it in one day. I think the most significant tattoo I have is the pink one across my chest in French. In English it says “Life is an adventure, the heart leads the way” It’s something I live by and try not to ever forget that’s why it’s in a place I can always see. As a foodie you also feature delicious dishes on Strange Wonderful. What meals have you had that still keeps you salivating to this day? Tacos & Pizza! I love tacos and being from Jersey I feel like I get the best of both worlds because both are never that far away. Anytime I’m in a bad mood I eat and it puts me in a happy mood. However, one of my favorite places to go is Burger Deluxe for milkshakes when the weather is really good, the Strawberry there is my favorite. I hope what I’m doing 2-3 years; I’m doing in 5 years. I hope to become either an editor, film director or possibly have my own talk show in the next few years. I’d want to be like Oprah and own my own network and start making my own movies and books. I love kids so possibly start a program that can keep kids off the street and give them a place to learn a craft or something they're passionate about.